It was the summer of 2007 and wildfires were roaring from Santa Barbara to the US Mexico border. The Santiago fire was one of many, it began on October 21st, 2007 in the foothills north of Irvine and east of the city of Orange in Orange County,California. I was a victim of this fire. Displaced and roaming the streets an emergency personal found me and I was sent to the Orange County Animal Care facility. 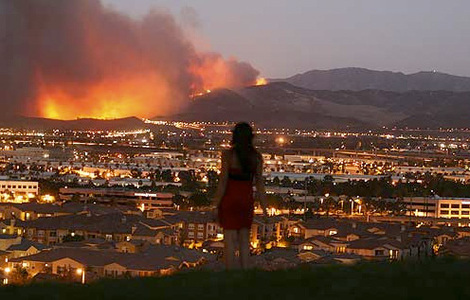 A photograph submitted to the L.A. Times by an unnamed Irvine resident shows a woman watching the approach of the Santiago Canyon Fire. The number of animal that became homeless or lost was staggering. Shelters every where were filled to capacity. There were many displaced puppies and everyone loves a puppy. I was already four months old and forty pounds with feet as big as an ox. I was put in with the adult dogs because of my size, not a place where people look first when wanting to adopt. Plus I am black. Have you ever heard of Black Dog Syndrome? It is said that we don't "pop" as much and people tend to not see us in a shelter. 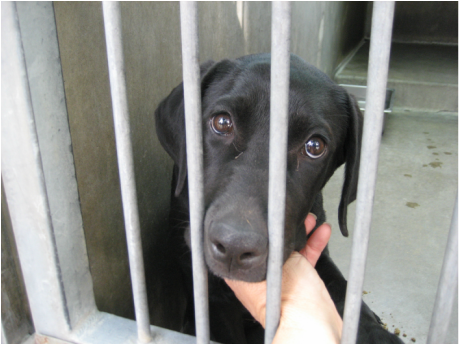 Black Dogs in short are typically left behind. Size, placement and color there was a triple whammy, I was worried that I wasn't going to find my home or ever be adopted. Yep that's really me in jail, she started taking my picture from the moment she first saw me! that a scared little chicken caused. 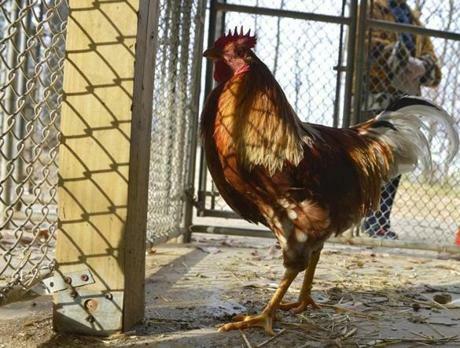 I never retreated to the rear of the cage in fear and I never charged to the front in hopes of landing a home. I just was, nothing more nothing less. So I acted no different when the feather bird stopped panic stricken right in front of my cage. I turned my head sideways to check it out as if to say, "who are you?" and that is when she fell in love. I was on a five day hold due to being lost roaming the streets near the Santiago fire areas. Debra Jo was there day three, day four and day five too. The next day I was free to go home with the first person who wanted me. Debra Jo went home that night and couldn't sleep. She was excited, she was scared she would lose me to some one who may get there first. She couldn't stand it! So she got out of bed and went to the shelter and sat there with her back touching the gate marking her place in line as place number one! It was 2:15 AM! Right from the start I was wanted, I was important and I was number one! I went home on November 6th, 2007 to my new family and home. I have two humans, a menasury of critters that I am in charge of known as the Zen Zoo. Anyone adopted is lucky on both ends but sometimes you both just score! This was actually the first time we met. Being on a fire hold all pets must be purchased sight untouched. This was approximately 9 AM after paper processing, I was so so so happy to have her and her they let her hold me for the first time! What's my date of birth? How did I get my name and What breed of dog am I?